Visit the fabric store to find the least expensive fabric that is available. Ask the store clerk to show you fabrics that are unlikely to be discontinued. 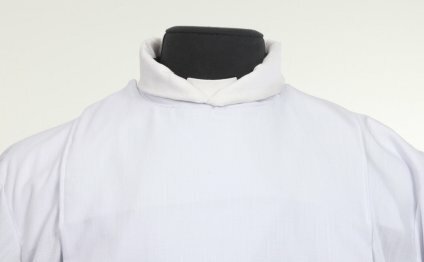 Do not choose a discontinued fabric that will be unavailable later on, when more robes need to be sewn because the size of the choir has grown. Select a fabric to make the robes that is durable. Ask the store clerk to provide advice on this. Do not choose a fabric that is subject to fraying. Set the fabric on a large table. Place the pattern on top of the fabric. Attach the pattern to the fabric using pins. Cut the fabric out. Follow the directions on the pattern to produce the correct size. Attach the parts of the robe that have been cut out using straight pins. First, connect the panels that will form the body of the robe. Turn the body portion inside out. Connect the upper portion of the sleeves onto the armholes of the body using straight pins. Make sure that the wrong side of the sleeves face out.